In a few weeks, I'll be moving to a brand new office (literally brand new floor constructed just for our program), so I wanted to create something special for the wall. 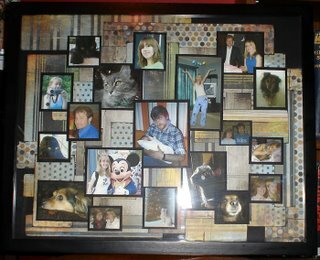 After a trip to Michael's last week where I picked up a 16 X 20 black frame for just $8, I decided I wanted to do a collage of scrapbooking papers and photos. I used various Basic Grey papers and inked all the edges. 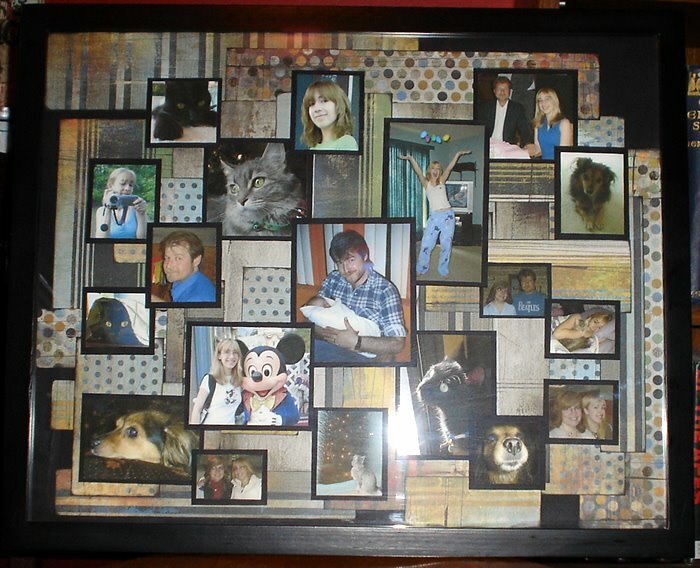 On top of this, I printed off some of my favorite photos of my daughter, hubby and fuzzballs. Each one is matted in Bazzil Raven cardstock. It's kind of hard to see in the photo, but some are also mounted on foam to raise them up for varying heights in the collage. I can hardly wait to hang this in my brand new office! Oh crap, that totals 12 movies....I could have stopped at number 1. 1. Amazing Race - the best reality show out there. Really. Emmy says so too. 4. Roast turkey with some kind of sauce too...oh yeah, gravy! Thanks for the tag Sofia! 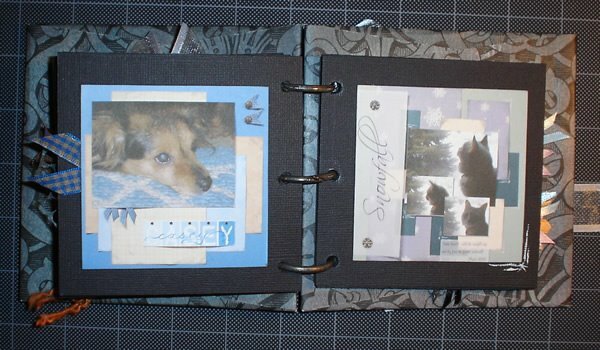 If you became a scrapbooker-for-hire, who would you want to work for and scrap their life story? Why? This can be a distant relative, friend, celebrity, or historical figure...living or not. 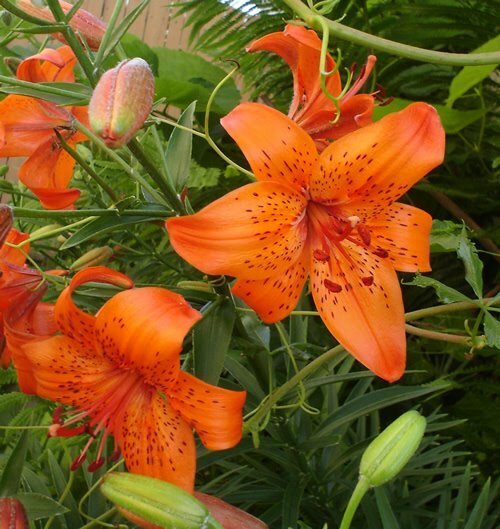 Actually, I realize I haven't been all that discreet so he may in fact have an inkling of my secret crush ... I mean, really, other than playing Pirates multiple times over on DVD, trying to watch any Depp movie that may come on television, or nearly killing myself running to the TV when I hear his name mentioned.... well, he MAY in fact not be too surprised at my answer. I mean the man has so many great stories to tell...(Mr. Depp silly, not my husband) I think it would make for one amazing album. But that's not what's important. No, no, no. The important thing is that I would actually get to meet him (again, Mr. Depp, NOT my husband). Now THAT'S what's important here. Gad, now I have to hone my skills to Supreme-Master Scrapbooker® and somehow get the word out to France of my availability for hire. Yes. I know. It's not Sunday yet. Somewhere it is. So there. How do you take your coffee/tea? In a Starbucks take-out cup. Actually, both with lots of milk and sugar. Actually, WAY too much sugar. So much sugar that I get teased about it EVERY FRIGGIN' TIME! How do you like your eggs? Cooked. I cringe at that scene in Rocky and will never look at raw eggs the same way again. Favorite breakfast foods: One that someone else makes for me. And delivers to me in bed. Yeah, that would be it. You're feeling lazy. What do you make? Probably nothing. You said lazy, didn't you? You're feeling really lazy. What kind of pizza do you order? Chicken. With mushrooms. Extra cheese. But do I really have to pick up the phone and order it? Who's going to answer the door when it arrives? These are vexing questions when one is REALLY LAZY. Do any foods bring back good memories? Does ice cream count? I have good memories of pigging out at the DQ. Do any foods remind you of someone? Not really; I don't usually eat people. Is there a food you refuse to eat? 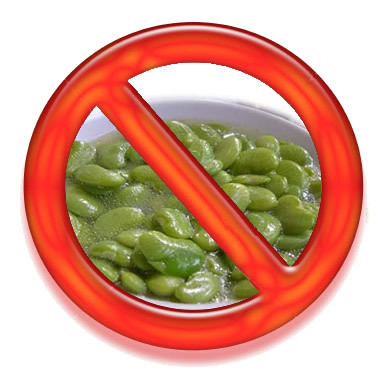 Lima beans. Vile, evil little things that were put on earth to torture little kids at dinnertime. What was your favorite food as a child? Mom's hard sauce (no, it's not booze, silly; it's a very, very sugary topping you put on Christmas pudding). Is there a food you hated as a child but now love? Bacon. And coffee. But not in the same bowl. Favorite junk food: Popcorn. Is that considered junk food??? Favorite dessert: Anything with raspberries. Okay, not ANYTHING. Not lima beans with raspberries. I draw the line there. So you can stop reading now. 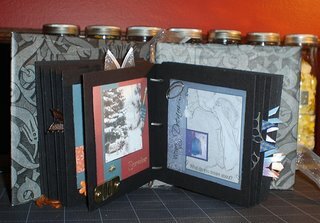 A few days ago, I had an idea for a mini-book and completed it last night... Instead of lugging a heavy 12 X 12 album around, I wanted a little book I could take to work or anywhere I wanted that held miniature versions of some of my favorite layouts. Since I already had many of these pages photographed, all I had to do was resize them to 300 dpi and 3 inches square and print them out. Measuring 5 X 5 inches, the chipboard front and back are covered in Basic Grey "Black Tie" paper, and I used my new Crop-A-Dile to punch holes and set eyelets for the three jump rings. 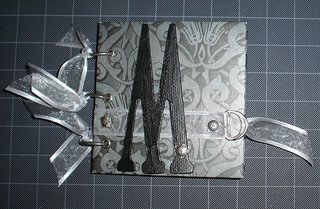 I painted a chipboard letter "M" black (M for "Maureen") and set a pewter flower brad into it. Another two matching brads hold the ribbon in place on the front cover. 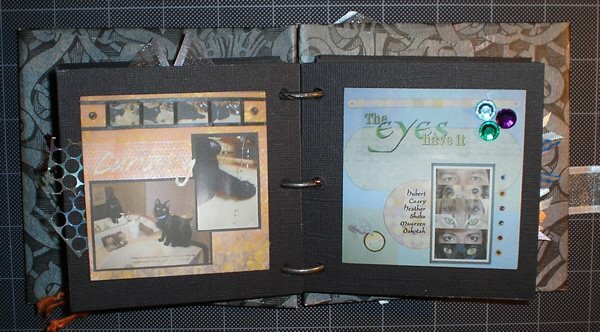 Inside are thirty 4 X 4 inch pages of some of my favorite scrapbook pages, and I embellished each one with something that matched the layout; either a real piece of the same ribbon, the same brad, flower or other trinket. I even had a spare "Dead Man's Chest" key for my mini-Pirates page! This project was a lot of fun, and I am sure it won't be the last mini book I do! 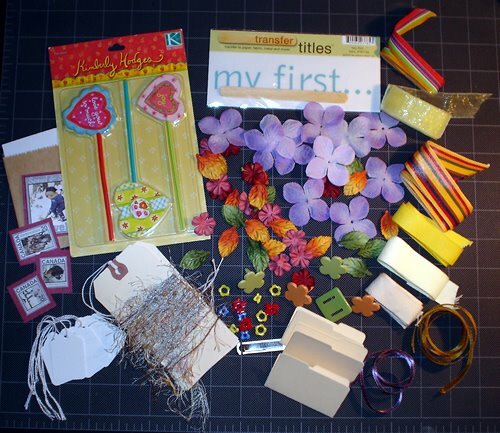 Write about how you first got "hooked" on scrapbooking. Was there a friend, family member, local hobby shop or just the good ol' lure of the Internet that introduced you to this obsessive, wallet-draining, wonderful, time-hogging, albeit important hobby? Easy answer: my daughter. Yup, I can definitely pin the "blame" on her....I can even remember that cold day in February, 2005. She came home from school raving about a girlfriend's "scrapbook" and asked if we can look into starting our own. 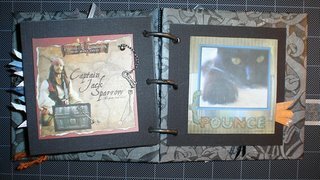 Now, I will admit, much to the horror of my fellow 2Peas ... years ago I had a negative impression of scrapbooking. But that was only because it conflicted with my then-current hobby of collecting Star Wars toys. "Huh?" you ask? Well, a local second-hand toy shop where I used to score great deals on collectibles was owned by a husband and wife. 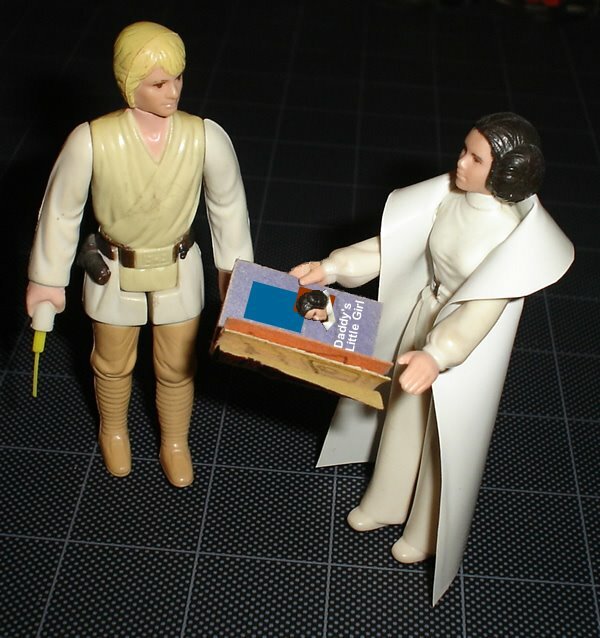 The hubby was interested in toys, but the wife was into a new fad (or so I thought at the time) called 'SCRAPBOOKING'. Soon the hubby was losing his war of store supremacy; the vintage toys were disappearing, and more and more square footage was being overrun by albums, paper and stickers. "Who the heck would go to all that time, trouble and expense?" I thought. (Okay, I said it VERY loud, but as usual, no one listened to me). But I was just mad that my precious toys were being squeezed out. Sadly, it wasn't long before the store shut down completely, and I blamed "scrapbooking" as the reason. The rest is history; I was hooked from the start and now my scrapbooking collection is nearing the size of my Star Wars collection....yes, I AM that obsessed. There is no hope. Heaven help me if scrapbooking is replaced by yet another hobby that devours me completely. but I STILL need a picture of Vader for my family scrapbook!" 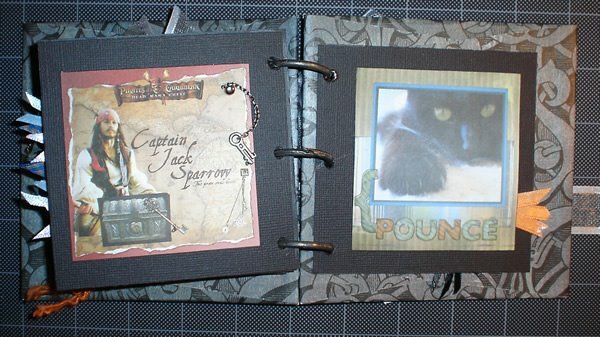 Two more layouts I completed at cropping night tonight. I just love taking photos of Dakotah, she is so photogenic. 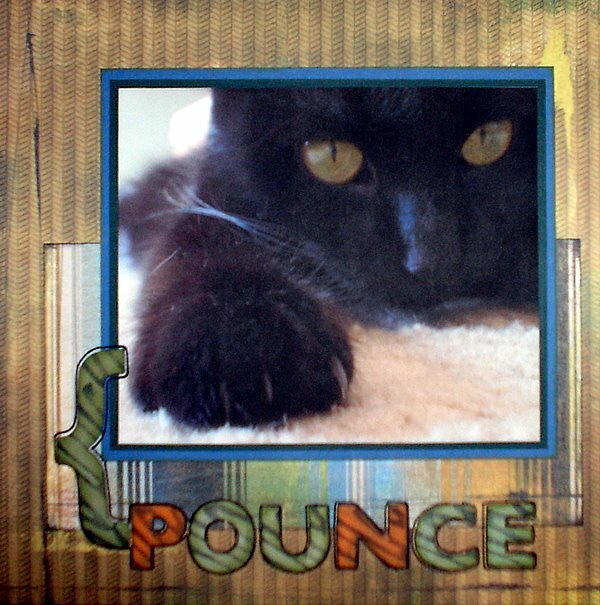 I am especially enjoying getting different points of view; getting down on the floor and up close (as in the "Pounce" page). Layouts of the pets seem so easy to make... 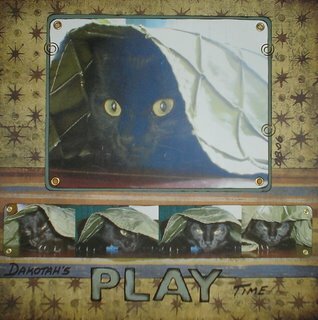 Basic Grey paper, Bazzil cardstock, chipboard letters and a few embellishments are all I used, but I may add some ribbons to the "Playtime" layout. (Dakotah playing under my dining room table runner -- see my Stale Coffee blog for a video of this event). As with everything, as humans we tend to forget the "big picture" when we get obsessed over something. Case in point - scrapbooking. When daughter asked me to start this hobby last year (her friends had introduced it to her), I was instantly hooked. I loved the idea of making something "artful" out of my family photos and sharing the experience with my daughter...who will someday be the owner of said albums. As we progressed thru our photos, the focus turned from "what was important" to what "looked good". Photos that weren't "perfect" were set aside for more artsy, well composed shots. 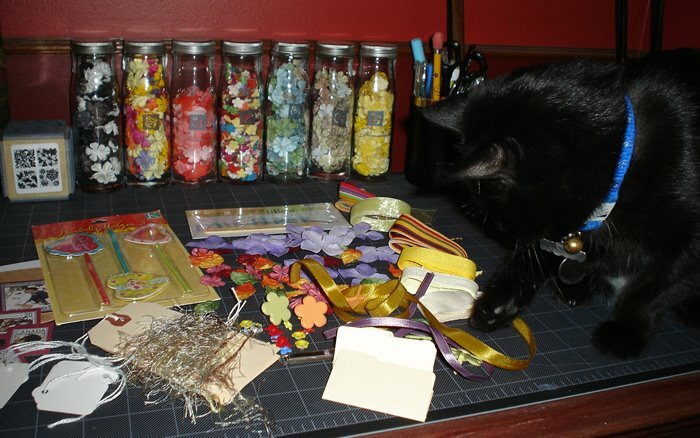 Choices of paper, ribbon and embellishments were agonized over but journalling the event was all but forgotten. No more. This post at 2Peas in a Bucket changed all that. It reminded me once again of WHY I scrapbook. I don't think generations from now will care if my paper was Basic Grey, or that the brads didn't EXACTLY match the cardstock; they will want to know the STORY behind the photos... the event. The lives behind the pictures. We all need to have a kick in the rear and remember what is truely important about this hobby. Wow! What a nice surprise... check out all the goodies that arrived in my mailbox! Thanks to fellow Pea "Teatimetamera", I'll be playing with all this great stuff for awhile. On 2Peas in a Bucket, she put out a request for someone to make her some blinkies for a few challenges she participates in. I love to do these, so I made her three; a Disney one, a Color Challenge one and a PeaLift blinkie. Thank you, Teatimetamera - you were more than generous!!! My daughter and I already are drooling over the awesome ribbon, eyelets, tags, stamps, rub-ons, flowers and everything. Can't wait to use them!!! ...and Dakotah likes them too.